later by an unscrupulous art dealer. Two recently published books advance new theories about the famous explorer who may not have been the first to discover the Americas but was the one who set off a chain of events that led to exploration, conquest, and colonization. One author claims that he was really Scottish and the other that he was a spy! In "La vida de Cristoforo Colonne" published last month in Spain, Alfonso Ensenat de Villalonga, an engineer and amateur historian, advances a startling new theory that revises the way that Admiral Christopher Columbus has been portrayed for centuries. He claims Columbus was the son of wealthy Scottish merchants living in Genoa and not poor weavers! But did he look Scottish? The portrait to the left which is currently on display in the Metropolitan Museum of Art and widely published in school textbooks was painted by Sebastiano del Piombo (1485–1547) many years after Columbus' death. Piombo was one of Michelangelo's students and may have been the most sought after portraitist of his day. He didn't even learn how to paint until 10 years after the death of Columbus. Though it bears an inscription that says it is a portrait of Columbus, ever since the 19th century many art historians have dismissed the inscription as having been added years later to increase the value of the painting. Piombo's biographer, Michael Hirst, includes the painting in his biography, but with the simple caption, "Portrait of a Man." The subject was probably a Bolognese cleric painted around 1530. Due to its great artistic quality it still remains the most enduring image of Columbus even though the subject's identity has been in doubt for over 100 years. So, who was Christopher Columbus and what did he really look like? 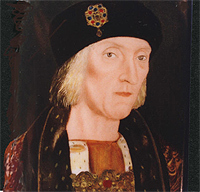 His younger son, Ferdinand, described him in his biography as tall, well-built, with a long face, high cheekbones, an aquiline nose, light-colored eyes, pale skin that tended to redden, and blond hair that turned white by the time he was thirty. In 1493 a young court page witnessed Columbus' triumphal entrance into the city of Barcelona. Later he described him in a book nearly the same though he added Columbus had very red hair, a ruddy complexion, and freckles. It is possible that he dyed his hair or wore a wig for the festivities since no other contemporary reports mention red hair. Whether his hair was blond, red, or white, the descriptions by his son and others bear little resemblance to the Piombo portrait of a man with a round face, fat nose, and dark hair. In fact, the written descriptions of the Admiral could easily describe a Scotsman. who knew Christopher Columbus personally. 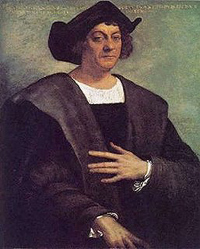 According to Paul Martin Lester, out of the 71 or more portraits of Columbus, the painting that is most likely an accurate portrait was by Alonso Berruguete ( 1488 – 1561 ) since he knew Christopher Columbus and painted him less than 15 years after his death. 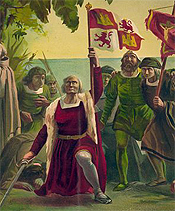 Berruguete also lived at court in Valladolid where the people remembered Columbus well. If this is the Admiral's true likeness, he does indeed look Scottish. The traditional story is that he was born Christoforo Colombo the son of a weaver who lived in Genoa, an independent citystate northwest of Rome in Liguria, Italy. Genoa was a wealthy seafaring state controlling many islands in the Mediterranean. Though the child Christoforo undoubtedly existed, this may not have been the same child that grew up to be the great explorer. Very little is really known about Columbus' origin or history before he married into the nobility of Portugal. What we do know is that he was never known as Christopher Columbus during his life. He started calling himself Colón or Colom (he used both spellings) when he was a young man and didn't adopt Christoferens (not Cristoforo) as a first name until he went to the Spanish court to ask for funds to explore the western sea. Christoferens Colón means Bearer of Christ and the Holy Spirit. Some historians say that he was a member of a family of mercenaries who were well known enemies of the King of Spain and that is why he changed his name. Others say it was because he was ashamed of his humble beginnings as the son of a weaver. The amateur historian Alfonso Ensenat de Villalonga claims that he has proof that he was born in Genoa, but not to weavers. Instead, he was the son of expatriate merchant parents who relocated from Scotland. He was christened Peter (Pedro in Italian) and was called Scotto, meaning the Scot. Pedro Scotto had a hard time blending in with all his red hair, the story goes, and so he pushed himself all the harder to stand out. He became a sailor at the age of 14, fell in love with the sea, and learned how to navigate. He didn't learn to read or write as a child, but he taught himself Latin, Portuguese, Spanish, and Greek after he left Genoa. While he was still a young man with no great accomplishments he married into Portuguese nobility. This has led to more theories that he was really from a noble Portuguese or Catalán family with ties to other great navigators, otherwise he wouldn't have had access to books and tutors or could have been an acceptable suitor and, eventually, husband to Dona Filipa Moniz, daughter of the governor of Porto Santo in the Madeiras. 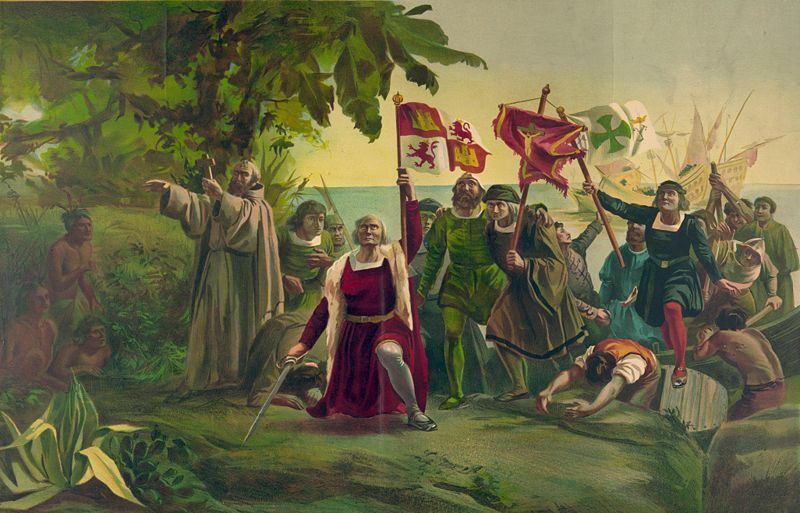 Portuguese historian Manuel da Silva Rosa puts forward one of several theories claiming that Columbus was Portuguese in his new book "O Mistério Colombo Revelado" ("The Columbus Mystery Revealed"), describing how Columbus may have been a "secret agent" for King John II of Portugal, as part of a plan to misdirect Portugal's rivals concerning India. This theory explains why Columbus went to such lengths in his own lifetime to obscure his origins. It also explains many contradictions and inconsistencies in his own writing. During this time, King John II of Portugal was consolidating his control over the African gold trade and had succeeded in establishing a South African trade route to India. This was necessary because the overland route used by Europeans for centuries was blocked by the rise of the Turks in the Middle East. No one had sought a route to India by traveling West around the world even though most educated people believed that the Earth was spherical. However, based on ancient Greek calculations the unexplored Earth was as vast as the known world and covered with nothing but water. That would have made it too great a distance for any ship to travel without making port for supplies and water. Columbus, on the other hand believed the world was much smaller. In a way they were both right, the world was bigger than he thought but there was land in between. The Spanish had just fought a long war against the Moors in Spain and had recaptured all the land in the South at a great cost. Before they rebuilt their treasury, King John II of Portugal, according to de Silva, sent Columbus to the Court of King Ferdinand and Queen Isabella to entice them into emptying their treasury further to fund his voyage and thus eliminate any chance that they would try to attack Portugal or challenge his dominion over the African sea route to India. written in his own hand. People say that Columbus died penniless, but that is not true, he died disappointed that he never regained his title of Viceroy and Governor of Hispaniola (modern Haiti and the Dominican Republic) and was suing the Crown for his share of the riches he had discovered, but he was far from penniless. It is well documented that after his death, Columbus' younger son, Ferdinand, inherited a large library of books, charts, maps, and journals from his father. With the rest of his inheritance he built one of the largest and most complete libraries in Europe and paid for full-time librarians to staff the site day and night. Upon Ferdinand's death the bulk of the library passed into the possession of the Cathedral of Seville, so we have a tremendous amount of primary documentation on the adult life and voyages of Columbus. One of the most intriguing theories sounds like the subplot of a Dan Brown novel. According to de Silva not only was Columbus a spy but, "Columbus's cryptic signature, "XpoFERENS Colon" as we decipher it, indicates that he was a member of the super-secretive Templar Military Order of Christ, which had a stronghold in Portugal at the time leading up to his voyage. As a member, like his father-in-law and brothers-in-law, he was dedicated to ridding the world of Muslims, who had invaded and occupied his country several centuries earlier." Whatever we know about Columbus it is clear that he was a strong, ambitious man, highly intelligent but deeply flawed as well. He drove himself and those around him without mercy and tried to amass great power and fortune. He often wrote of himself as a foreigner, an outsider. He was extremely secretive and lived in a time of secret societies, secret missions, and international intrigue. If he was not one of the plotters, he was surely manipulated by those who were. He moved in the highest circles of power, yet he preferred to live on the far side of the earth. On his 4th trip to the New World he earned the enmity of those around him who complained to the King of Spain that he was a bad governor. Columbus was deposed and stripped of his title and rank. He spent the rest of his days suing to regain what he had lost. He died without success in his villa outside of Valladolid, Spain, at age 54. Eventually his elder son, Diego, regained the title and became the 4th Viceroy of the Indies. Whatever his early life was, it shaped his personality in adulthood. In most cases tall, handsome, vigorous, young men with sharp minds are very popular with their fellows—unless there is something about them that makes them peculiar. Perhaps he grew up in Genoa a gangly, red-headed, freckled boy named Pedro, with immigrant parents who spoke broken Italian. He wanted to make friends with the dark-eyed boys with brown limbs, and curly black hair who lived near his home but they bullied and teased him for his pale, white skin and odd ways. He hated who he was and swore to grow up and show them he was greater than them all. But in the end, no matter how much he learned, or how hard he worked, or however many accolades he received, he still remained the same little boy inside, who didn't fit in, the outsider. Looks Are Deceiving: the Portraits of Christopher Columbus by Paul Martin Lester. O Mistério Colombo Revelado ("The Columbus Mystery Revealed") by Manuel da Silva Rosa. La vida de Cristoforo Colonne ("The Life of Cristoforo Colon") by Alfonso Ensenat de Villalonga. The Mysterious History of Columbus by John Noble Wilford. If you want to add this article to your list of favorites or email it to a friend, please use this permanent URL, https://stores.renstore.com/-strse-template/0903B/Page.bok. Permission is granted by the author to quote from this page or use it in handouts as long as you include a link back to Renstore.com.